Happy Monday, Everyone! According to the Foodie Holiday Calendar at OCFoodies.com, today, which is November 19th, is “Carbonated Beverage with Caffeine Day”! Being a Michigander, I grew up on some wonderful, Michigan-made, carbonated beverage products like Vernors Ginger Ale and Faygo Pop. We (Michiganders) call it “pop”; while, it seems, everyone else calls it “soda”. No matter what you call it, add a few scoops of ice cream to it and you have a delicious concoction that some call a “cooler”; while, others call it a “float”. 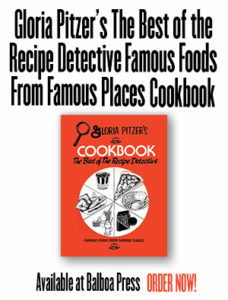 For those who don’t know me yet, I am Laura Emerich and my mom is Gloria Pitzer, the ORIGINAL “Secret Recipe Detective”. I remember Mom running test after test, for weeks on end, trying to develop her own homemade version of cola because of requests from her “listeners” (the radio audiences, listening to her many different radio talk-show “appearances” across the country). She was often asked by the listeners, who called into the studios of the shows on which she was interviewed, what products or dishes there were that she couldn’t replicate. She often answered, “Cool Whip and Coca-Cola”. I always thought, myself, that it was not that she couldn’t replicate them, but that she hadn’t…yet! Most of the thousands of make-alike recipes that Mom developed were inspired by “listener” requests. Sometimes she could develop a close make-alike version simply by taste tests. Other times, all she had to go on was a description of the product or dish from the requester. Sometimes Mom could develop a make-alike version of some product or dish in a matter of minutes or hours; sometimes, it took a few days or weeks. Sometimes, if it was an extra-challenging recipe, she’d even “shelve” it for a little while and come back to it with a fresh, new perspective; but Mom never gave up on a challenge! In fact, Mom decided she was going to face “the Coke challenge”, so to speak, and discover a homemade version of cola. The challenge was on and Mom loved a great challenge! She persistently tested different combinations of ingredients to develop a syrup she could add to Club Soda for homemade soda pop. Making over 100 tests in about a six-week period, Mom finally developed a syrup for a close make-alike version of Coke-a-Cola, which she called “Close-a-Cola”. 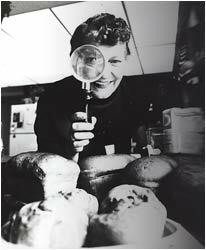 She also developed a syrup for a make-alike version of Vernors Gingerale (or ginger soda), a Michigan-made product, which she called “Veneers Gingerale”. 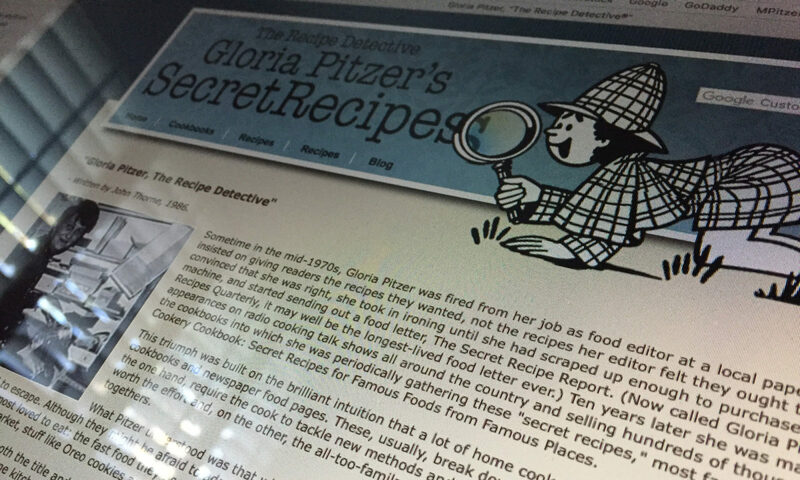 In fact, in the early 70’s, it was through radio and the “listeners” that Mom was initially called the “Recipe Detective” and she further developed that into her “Secret Recipe Detective” identity. RADIO turned out to be the most appropriate way by which we made people aware of what we were doing…my involvement with the wonderful world of radio actually came about without any specific intention of becoming a regular part of the broadcasting field… I didn’t know I had what is considered “a radio voice”. Heaven knows our five kids will, to this day, even in their adulthood, testify to the fact that, on occasion, during their up-bringing, I had been known to discover conditions that would prompt me to accelerate, vocally, in a pitch that only dogs in the next county could here! When “My True Story” was replaced by Bob Allison and his “Ask Your Neighbor” show was replaced by Bob Allison and his “Ask Your Neighbor” show… I was, at first, very disappointed. Household hints and problems around the house that you cannot solve yourself seemed like just too much homemaking information to please me. I soon, however, became ‘hooked’ on the show, as almost everybody does, to the point that, on Fridays, when Bob would sign off and say he would talk to us again on Monday, I was spending the weekends just looking forward to the show on Monday. I called the show about 2 or 3 times a month for the first year or two, to ask questions of Bob’s “neighbors” that my newspaper column readers were asking me. When I couldn’t find the answer from consulting other sources, I knew I could rely on Bob Allison’s “neighbors” to come up with the right answers for me. In return, I would often…phone in an answer that I occasionally had in reply to one of their questions or recipe requests. Bob did not recognize my voice as a regular caller until I had initiated the newsletter, however. He asked me where the [hamburger sauce] recipe came from that I was giving, in reply to one of his listener’s requests, which is how his program has always worked…In mentioning that the hamburger sauce recipe would appear in the next issue of my monthly newsletter, which I had given in response to one of his listeners’ previous requests, Bob reacted with great interest and curiosity. 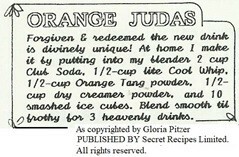 Mom used the same procedure for advertising or “getting the word out” about her “secret” make-alike recipes and publications until she, finally, fully retired and it always worked very well for her business, offering 15-20 sample recipes along with information for ordering her current, self-published cookbooks and newsletter subscription in exchange for a self-addressed, stamped envelope. Those are the recipes from which I’ve been choosing to work in with my “…Memories of my Mom” and to “re-share” with you. Blend together until smooth, 3 c. orange juice with 1 envelope “Dream Whip” powder, ½ teaspoon vanilla and 3 small boxes (¾-ounce each) instant vanilla pudding powder. Pour into ½-gallon pitcher and stir in 3 more cups orange juice. Makes 6 lovely drinks when served over cracked ice!